Dubai: Starting April, all overseas Filipino workers will be mandated to contribute to their pension fund in the Philippines with a higher rate of 960 pesos (Dh67) minimum monthly deposit to a maximum of 2,400 pesos (Dh168). The new mandatory contribution scheme with a 12 per cent rate hike has come into effect through the signing into law of the “Social Security Act of 2018” by President Rodrigo Duterte. Only an estimated 500,000 OFWs are covered by Social Security System (SSS) since contributions were voluntary in the old law. With the new law, SSS membership of OFWs could increase to 2.5 million. In Dubai, more than 7,000 Filipinos paid their premium in January 2018. But the average contributors for the entire year for Dubai and the northern emirates was just 4,800, which make up less than one per cent of the estimated one million Filipinos working in the UAE. Based on a circular 2019-007 released by SSS this month, the minimum contribution has been increased to Dh67 from Dh61 for those with a minimum monthly salary credit of 8,000 pesos (Dh559). The maximum salary has been set to 20,000 pesos with a contribution of 2,400 pesos (Dh167). Meaning, OFWs with higher salaries now need to contribute this amount and not the previous maximum contribution of 1,760 pesos (Dh123) for a salary credit of 16,000 pesos. It is not clear if OFWs may choose the amount from the contribution schedule (SEE TABLE) as was the practice under the old law. “OFW members who have already paid their contributions in advance for the applicable months of April 2019 onwards based on the old contribution schedule are advised to settle underpayments [according to the new schedule],” Commissioner Aurora Ignacio said in the circular. An official told Gulf News that OFWs who will start contributing this April do not need to pay the previous years or months as SSS does not accept retroactive payments. “What they can pay for is the current year and they can make advance payment of up to a maximum of five years,” he said. 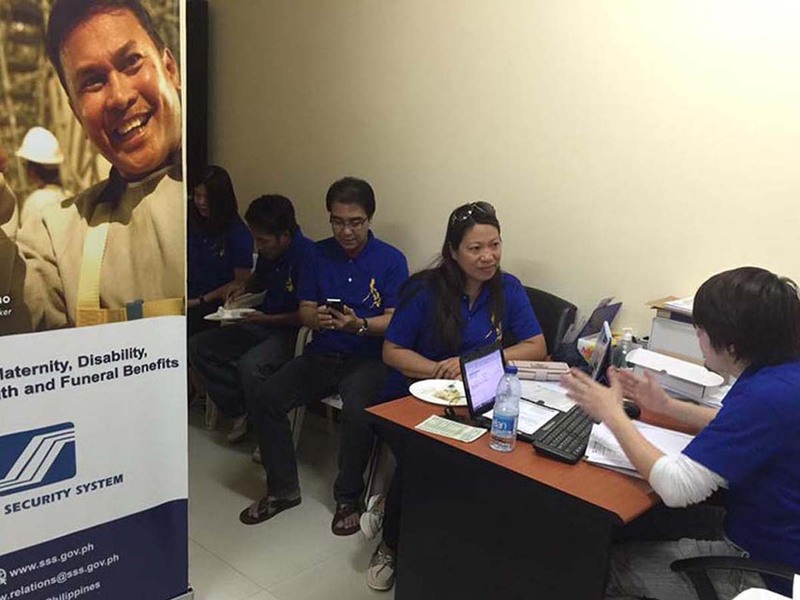 All SSS benefits enjoyed by members in the Philippines such as lifetime pension and other benefits such as salary loan, sickness, retirement, maternity, disability, death, funeral are also being received by OFWs in the UAE. SSS members who want to pay should first get a Payment Reference Number by visiting the nearest SSS branch or emailing to PRNHelpline@sss.gov.ph. Payment can be made at any of the SSS-linked remittance centres namely Orient Exchange, UAE Exchange, Al Ghurair Exchange, or Al Rostamani Exchange. They can pay monthly, quarterly, yearly, or a maximum of five years. The new contribution per OFW will depend on the provisions of the new law. But officials advise OFWs to ideally make the maximum contribution to get the maximum benefit. 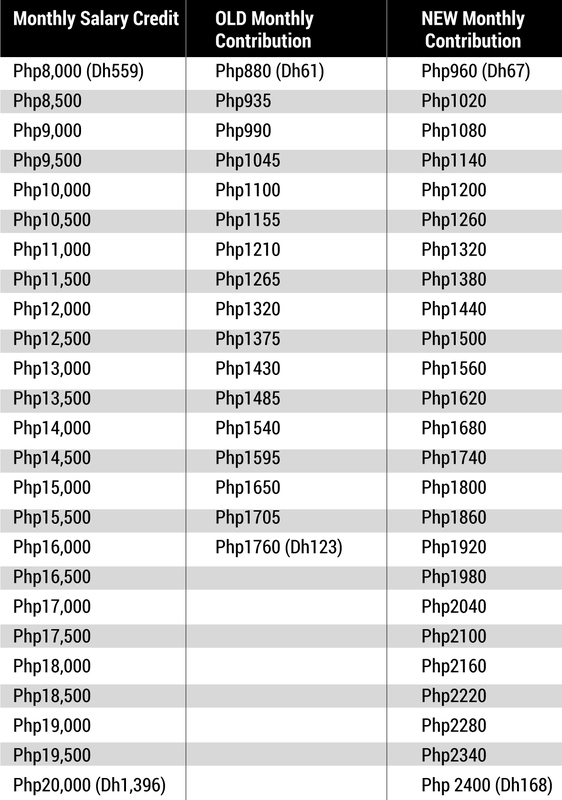 ■ The minimum salary credit for OFWs is Php8,000.